The old African proverb, "It takes a village to raise a child," may be as applicable to horses as it is to humans! Coconut, a 2-day-old Medicine Hat filly, enjoys exploring the outdoors for the first time as mom hovers nearby in the video below. The tovero-colored horse is followed closely by her mom as she trots around the yard on wobbly knees. The other horses in the group stand by for a close view of the new baby. One shot shows the sire (father horse) looking on from another field. Like an overprotective mother watching her baby's first steps, the mare chases the foal and hovers protectively when the owners step close. This behavior is typical of mares, who sometimes react in a very mother-bear fashion when they perceive a threat to their new foal. "First-time breeders should keep in mind that even the most mild-mannered mare might make this transformation when she has a new foal; it's worth being cautious when you approach," according to The Horse. A Medicine Hat filly is set apart by its unique coloring. 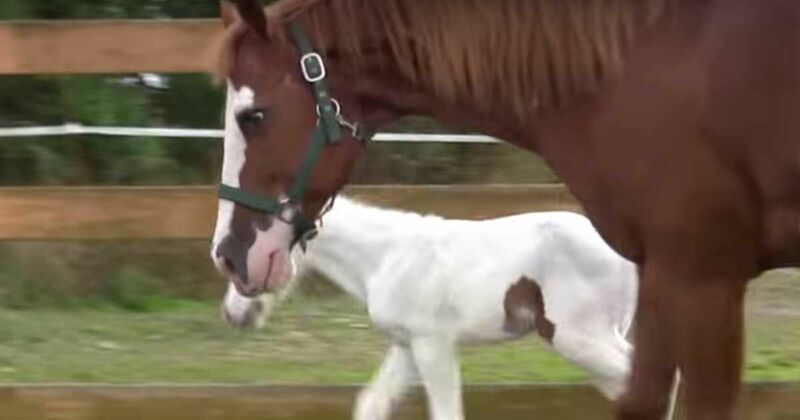 Mostly white with colored patches on the ears and head, and sometimes (like Coconut) a shield of color on their chest, the Medicine Hat filly is a type of American Paint Horse, according to PonyBox. This horse is revered in American Indian legends as a magical creature with the "ability to protect its rider from injury or death" during times of war and while on hunts. Additionally, folklore also label these horses as good luck charms, according to PonyBox. Coconut was born Feb. 5, 2013, and was priced for sale at $74,000 at last listing in 2013. It's unclear whether she was ever sold. Other videos by Down Under Colour show Coconut getting her first bath, playing with her sister and learning to walk on different surfaces. They suspected she was special even before she was born. Big Jake, a Belgian gelding horse, is often met with stunned silence as people try to 'comprehend' what they're seeing. A tiny dog is excited to meet a giant Great Dane for the first time. Born at the Warm Springs Ranch in Booneville, Missouri, this cute little horse is among good company of 70 of the most remarkable Clydesdales in the world. In this day of modern technology, it's not often that you see draft horses plowing the fields of farms. It's even less often that you see..
A baby bear needs a hero, and this man steps up to the plate.